In the town there are a great deal of churches. At the eastern extremity of the town centre, in via Pepoli, rises the big unit of the Annunziata (Our Lady of Annunciation), that is the most important town monument. At the back of main altar is located the Cappella della Madonna (Madonna Chapel), that you reach passing through a beautiful Renaissance arch, closed by a bronze grill of 1591. 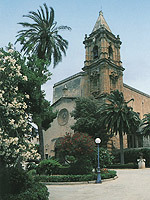 Nearby you may also find the ex-convent that today lodges the major town museum, the Museo Pepoli (Pepoli Museum). But it is in the historical centre that you find a series of churches of considerable interest following one another, such as the church of San Francesco d’Assisi (St Francis of Assisi), the church of Cappuccini (Capuchins), the church of San Pietro (St Peter), that one of the Purgatorio (Purgatory), placed in the homonymous little square. Very beautiful is the Cathedral, in corso Vittorio Emanuele, consecrated to St Lawrence, and erected on a former fourteenth-century building in the seventeenth century. One of the most charming streets in the town is via Garibaldi, lined with eighteenth-century mansions and churches, among which Riccio di Morana mansion, crowned by statues, Milo mansion and Badia nuova (S. Maria del Soccorso), one of the most ancient church in the town, stand out. The mansion, that close the street in a scenographic way, is “Palazzo Senatorio”(Senatorial Mansion) (or ”Cavarretta”), the face of which is on two orders articulated by columns and statues, and it is crowned by two big clocks. Near by there is the clock tower of thirteenth-century origin. To be visited is also the via Liberta’, where are located the church of the Carmine, in Renaissance style, founded by Carmelites, Fardella Mansion and Sanseverino Mansion. The most important streets, destinations of long walks, are Via Fardella, that scours almost all the town, and Corso Vittorio Emanuele. Especially in the night, the streets crowd of people spending some hours in the various spots. To be visited moreover: the Museo della Preistoria e Archeologia Marina (Prehistory and Sea Archaeology Museum), situated in the Ligny Tower, e la Riserva Naturale delle Saline (Natural Reserve of the Salinas), that follow one another in the coast-line between Trapani and Marsala, in a so incredible scenery where silence and stillness reign.